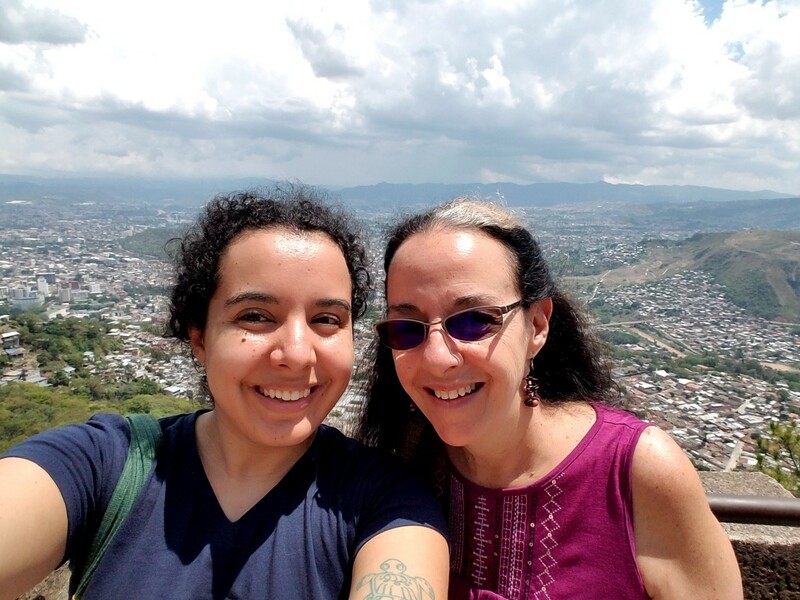 My mother and I in Tegucigalpa, Honduras. Granted, I am a very privileged Central American migrant. I was born in Costa Rica with dual citizenship, and had the luxury of traveling extensively with my grandparents around the United States during my formative years. Even so, I never forget where I came from. When I arrived in Texas almost ten years ago, my U.S. citizenship did not immunize me from the culture shock I felt when speaking to my “peers.” I marveled at things they took for granted. I was amazed by things like air conditioning on buses, sidewalks, and most unnervingly, the eerie sense of safety with which my classmates seemed to carry themselves. I have spent the last decade loosening the vice grip that I was conditioned to keep on my purse while out in public. Yet my “third world” experience pales in comparison to the daily reality that my Honduran family faces. My grandmother was Honduran, and my mother was born in Tegucigalpa. The people in Honduras are some of the kindest I have ever met, and it pains me that a country filled with so much beauty is being so poorly managed. On a day to day level, my family deals with the nuisance of not being able to drink water straight from the tap without boiling it first, or the fact that my cousin who is a university professor can’t always rely on a steady paycheck. On top of that, every once in a while, they have also had to deal with the harsher realities of life in Honduras. I remember how, when I was a child, I was told that my mother’s godfather in Honduras was kidnapped. I was too small to understand the magnitude of what happened next. Our family paid the ransom, and the criminals returned my mother’s godfather- dead. I remember my mother explaining to me why we were wearing black, and me thinking it all sounded like a scene from a crime show. Late last year, as news reports flooded in about Honduran people – my people – being tear gassed at the border between San Diego and Tijuana, I felt a deep mixture of anger, helplessness, and grief. From where I live in San Diego, I could drive less than an hour to get to the Benito Juarez Sporting Center, where the migrant caravan had set up a temporary shelter. I felt so close, yet so far away, and so powerless to do anything. Then it dawned on me that I could do my internship special project on working with people in the migrant caravan. I knew I had to at least try, because if I didn’t, I would be ashamed of myself. In December, I sent out volunteer applications to five organizations in the San Diego/Tijuana area working with Latin American refugees and asylum seekers. I explained in my applications that I was a music therapist in training who wanted to provide music therapy services to members of the migrant caravan. I then spent the next few weeks fixated on news reports from the border, waiting. Unfortunately, almost a month later, only one organization got back to me, and it was to say no. Their facility wasn’t suited for music therapy services, because asylum seekers spent less than 48 hours there and had urgent matters to attend to during their stay. The only other organization that got back to me (weeks later) said that they were looking for volunteers to be able to spend one to two weeks in Tijuana for training and field work, and I received no guarantee that I would even be able to provide music therapy services. That proposal simply wasn’t going to work for me with my internship timeline. Alas, my dreams of helping my people were falling through. I found myself paralyzed with fear, because I had spent weeks waiting and hoping for a positive answer, and now that none was coming, I was falling behind with my internship requirements. In January, as I sat at my desk unsuccessfully trying to make phone calls to the organizations I had previously contacted, I had an epiphany. Maybe working with the Central American migrant caravan directly wasn’t going to work out, but what would happen if I broadened my scope to think about refugees and asylum seekers of all nationalities? 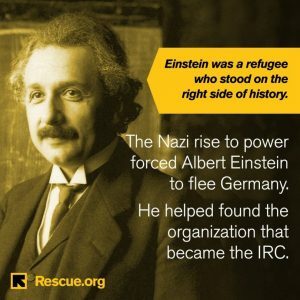 With a stroke of inspiration, I Googled the International Rescue Committee (IRC), and found that they had not one, but two offices in the San Diego area. Within minutes, I was on the phone with the volunteer coordinator, who sounded genuinely enthusiastic about music therapy for their clientele. She got me a volunteer application and background check request right away, and told me that she would get back to me within a week with specific points of contact within the organization. She over-delivered by emailing me the next day to put me in touch with their Youth Program coordinator. 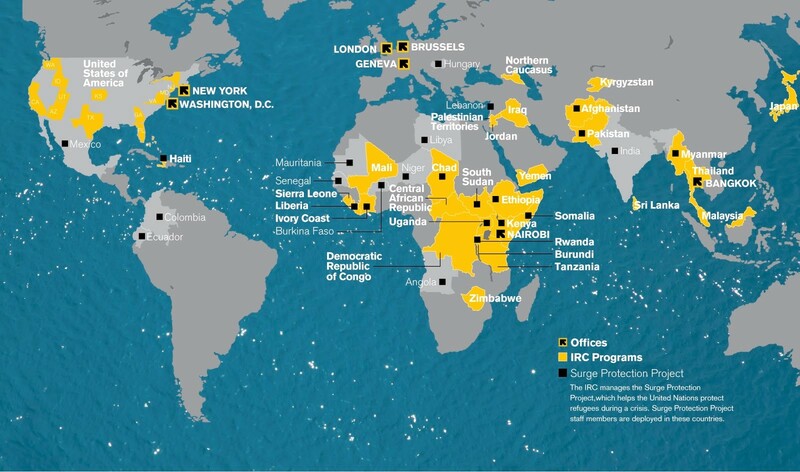 I had a couple of weeks to prepare for my first meeting at the IRC, and I used the time to research everything that I could about the IRC and music therapy with refugees. Created at the request of Albert Einstein over 80 years ago, the mission statement of the IRC is to “help people whose lives and livelihoods are shattered by conflict and disaster to survive, recover, and reclaim control of their future.” The organization focuses concerted effort into educating and empowering female refugees in particular, aiming to end cycles of domestic and sexual violence so that these women can thrive in their new environments. I spent time studying areas that music therapy can directly impact from the IRC’s webpage detailing the goals of the organization. Of note, music therapy can help achieve objectives in the IRC’s target areas of mental/emotional health, safety, education, and power. These goals can be addressed by using music to facilitate the creation of safe spaces for emotional expression, community building, stress relief, and social support. Music therapy can also help with English language learning and other educational skills needed in a new country. The available research on music therapy with refugee populations is limited. I’ve always enjoyed a challenge, though, so taking on a project on which there is a dearth of extant literature is something I find exciting. The research I did find gave me valuable pointers about what might and might not work with my future clients. Of course, trauma-informed care is important, but so is seeing refugees as multifaceted people whose needs are more complex than the trauma they may have endured on their journey to their new homes. Music therapists working with refugees also recommend incorporating music from the refugees’ home culture, especially if there is a language barrier. Obviously, respecting and making an effort to understand the culture of your clients is a must, especially with regards to the role of music. Since February, I have had the honor of being invited to 12 groups across both IRC locations in the San Diego area. The refugees that I have worked with have hailed from many countries, including the Democratic Republic of Congo, Tanzania, Ghana, Burma, Syria, Ethiopia, Somalia, Thailand, and Afghanistan. The majority of the people in my sessions spoke English at an intermediate to advanced level. Most of the groups I have worked with fall under the IRC’s Youth Program initiatives for teenagers and young adults. Four of the groups I participated in were with Girls Academy, an after school program geared towards female empowerment, community building, educational opportunities, and social support. Four others were with Peacemakers, a youth group with a focus on public speaking, self-advocacy, leadership, and communication skills. Though Peacemakers is open to both girls and boys, the group I worked with was comprised entirely of girls. I also lead two active music making groups for Intergenerational Wellness, which were open to all members of the community. Lastly, I provided music assisted relaxation and mindfulness workshops for the staff of the IRC for both IRC offices, because I know the importance of caring for people who give so much of themselves to their community. In another one of my favorite sessions, I asked each person in the group choose a song that has been important to them in their lives. We listened to a section of each song as a group, and then the person who chose it gave a short speech about why the song was meaningful to them. I was prepared for people to be reticent about speaking in front of the group about a potentially personal topic. Instead, I found that the majority of the participants were very excited to share their music, asking me “does it have to be just one? Can we share two or three?” Several times, one girl would choose a song and others would start dancing and singing along on cue, saying things like “Oh, this song reminds me so much of my childhood in my country! It was a big hit!” I was exposed to really fun music I had never heard of from places like Tanzania, Somalia, and Nigeria. The session ended with an impromptu “dance party”, because the girls were really enthusiastic about showing me their favorite African dance moves. I don’t always think of dancing as part of music therapy, but working with the clients at the IRC made me realize how important dancing is for this population. Dancing gave the girls in the youth groups an opportunity to express pride in their culture while giving them a physical outlet for emotional expression. At the request of the youth group participants, I spent one session teaching them how to belly dance (fun fact: I’ve been belly dancing for about 12 years). I took the opportunity to highlight the cultural importance of belly dancing, emphasizing the art form’s body positivity and celebration of femininity. Some girls were quick to point out parallels between some of the dance moves that I was teaching them and moves that they had learned growing up in Africa. I felt so happy to be able to provide these young women, who have gone through so much to arrive here safely, with a chance to learn a healthy leisure skill in a supportive environment. I held two pearls of wisdom close to my heart as my project unfolded. The first is that action cures fear. The second comes from Jewish tradition, and states that “it is not your responsibility to finish the work, but neither are you free to desist from it.” I spent weeks with my work at a halt out of a combination of hope and panic. Once I embraced “action cures fear” and started making phone calls instead of waiting for replies to emails I had sent a month prior, things started falling into place. The second quote reminds me to face the world’s iniquity with kindness towards myself, acknowledging that I am but one human being and cannot “fix” everything. I may not have been able to work with Central American asylum seekers, but the people I served through this project are just as inspiring to me. In the face of the United States’ current policy on refugees, I feel proud that I have been able to share my skills in helping them feel more welcome in their new home. If you are reading this and find yourself feeling distraught about the current state of the world, I encourage you to go out and volunteer your talents with those in need. Action does not just cure fear, it alleviates powerlessness – and your actions will make a world of difference to those you serve. Editor’s Note: Resounding Joy, MusicWorx’s nonprofit partner agency, has multiple volunteer opportunities. Or, visit the San Diego IRC’s website. Volunteermatch is a national resource for finding the right opportunity for you!